Home Riding and Training Horse Shows Show Clothes Splurge or Steal? Whether you are showing on a shoestring or spending your lottery winnings on the circuit, going through the in-gate looking – and feeling – like a winner is the ultimate goal. We talked to industry experts to get advice on putting together a great show wardrobe, no matter what your budget is. You can never go wrong with a classic, conservative look. Traditional styles and colors have longer lifespan that give you a better return on your investments. This is especially true of the pivotal pieces in your show wardrobe. In the English arena, the general trend is heading back to a more traditional look. “Conservative is better, regardless of price point,” advises Patricia Nesto, buyer for Dover Saddlery. “You really can’t go wrong with that.” While it’s nice to splurge on color and fashion, she explains that the classic route, such as a navy hunt coat, or a show shirt in blue, white or a subtle stripe will have more longevity. Nesto prefers to invest in quality over quantity. “Buy the best one you can, that fits you best, within your budget, in a conservative color that’s not going to go out of fashion,” she says. Going with a fashion color might be considered a splurge. When you are ready to build or expand your show look, you can often enhance it with less expensive items or accent colors. Fit will always trump the latest trend or gotta-have-it label. Poor fit can cancel out even a big-dollar investment of quality fabric and construction. With an important item such as a hunt coat, a fit faux pas really stands out. “If a coat is too big or bunchy, it detracts from the overall picture very quickly,” say Nesto, whose departments include hunt coats and show shirts. When shopping, she advises sitting in a saddle to check fit across the shoulders, in sleeves and length. “Probably the biggest mistake I see is people don’t consider enough the importance of fit,” she says. A common problem Dover Saddlery buyer Amy Hamlet sees is poorly fitting helmets in the show-ring. “It is very important to try the helmet on with your hair up, the way you are going to have it in the show-ring. That can make a difference in what size fits you correctly,” she advises. Western riders should also ensure their hat fits and is shaped properly. Quality show apparel, like good tack, has excellent resale value, so it really pays to educate yourself before you plunk down money on junk, says Vlietstra. To assess quality, look at the weight and weave of the fabric, how it feels, and the construction of the garment. Technological fabrics will up the price point a bit. 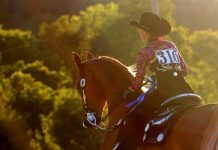 However, you may be very glad you splurged on the shirt or breeches with the moisture-wicking, breathable fabric on a hot, humid day – what price comfort, and that cool, calm, collected look as you start your round? Priceless. Custom items can also be cost-effective splurges. Factor in the expense of tailoring an off-the-rack item, and the dollars and cents just might add up in your favor. 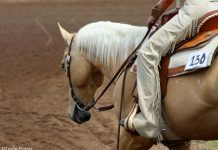 If you are hard to fit and custom is a necessary route, as is often the case for English riders when it comes to tall boots, Cyndy Miller, a buyer for Dover Saddlery, offers this advice to keep costs down. “When purchasing custom boots, staying with the basic custom boot and standard leather will assist with the budget – upgrading leather, adding zippers, et cetera, all lead to an increased price tag,” she says. Going too trendy is a common mistake in the conservative English arena, especially when you are starting out in the beginner ranks. 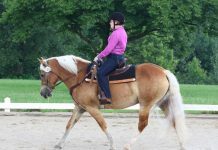 A flashy or very fashion-forward look stands out in traditional sports like hunters, equitation and dressage. Be sure your riding is up to that level of attention, especially from the judge. With a little thought and some strategic shopping, you can shop like a champ to put together a winning show wardrobe. BUY USED SHOW CLOTHES EXPECIALLY IF YOU ARE STILL GROWING!